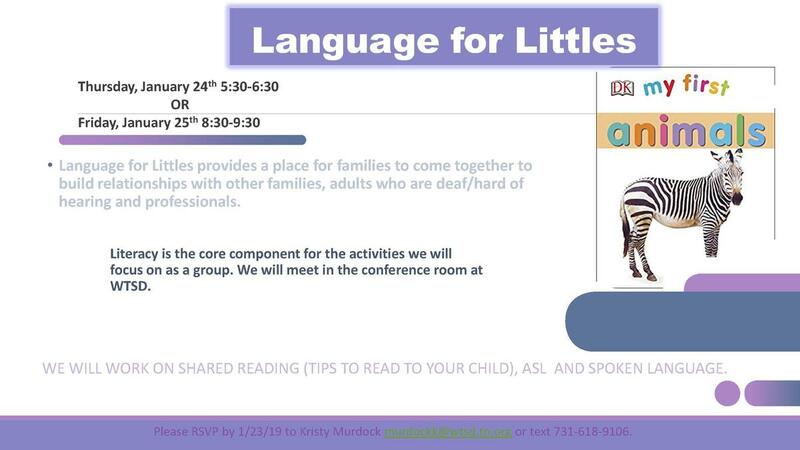 Language for Littles provides a place for families to come together and build relationships with other families, adults who are deaf/hard of hearing, and professionals. Literacy is the core component for the activities we will focus on as a group. 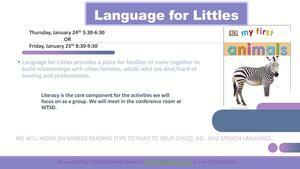 We'll work on shared reading (tips to read to your child), ASL, and spoken language. Meetings will be held in the conference room at WTSD on Thursday, January 24th 5:30-6:30pm OR Friday, January 25th 8:30-9:30. Please RSVP to Kristy Murdock at murdockk@wtsd.tn.org or text 731-618-9106.